At the recently opened STATS restaurant, clients who come for a meal are invited to choose the game they’d like to watch at their table. Purpose-designed sports grills are giving customers the chance to choose their own programming, with a separate screen at each table.No other area of AV business has benefited more strongly from the flat-panel TV revolution than the restaurant market. With their narrow enclosure depth, ease of mounting, bar-friendly screen sizes and ever-increasing image quality, plasma and LCD screens have literally changed the face of modern American dining. Never mind the neon signs, the menus, the décor or the drinks behind the bar—the focus of visual attention in many of our restaurants today measures 16 by 9. Of course, TV screens require content and, in huge numbers of bars, grills, brew pubs, and other quick-service establishments across North America, the programming that is prized above all else is sports. On one level, this can result in a single large plasma screen sitting behind a bar with low-level audio being played through a series of cheap-and-cheerful ceiling speakers. If you’re a customer and you want to watch a different game, you approach the bartender with cautious optimism and may, or may not, have your wish granted. At the other end of the scale, operators of purpose-designed sports grills are giving their customers the chance to choose their own programming, with a separate screen at each table. 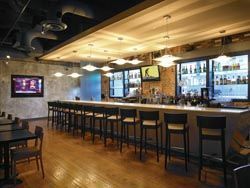 In Atlanta, at the recently opened STATS restaurant (see separate sidebar) clients who have booked a table are invited to choose their game at the front desk. At STATS, Smedley and his team have deployed a Crestron Rack2 Dual Bus control backbone and provided each of the venue’s bars with its own WiFi touchpanel and wall-mounted docking station, with a further touchpanel located at the main video processing rack. A dedicated closed WiFi network is installed to support the use of the touchpanels anywhere throughout the restaurant. The more sophisticated restaurant AV becomes, the harder it is for non-technical staff to keep up. This in turn increases the risk that a venue’s mood may be adversely, if inadvertently, affected by the misuse of source selection or other parameters. Furthermore, the problem is not confined to restaurants that offer a wide variety of AV content—it might be a simple case of inappropriate sound levels, for example. In such cases, the solution need not always be as complex as the multi-layered Crestron control used at STATS. At McGann’s Pub in Boston, Robert Soluri, president of local contractor Custom Cable Services, has given his client a cleaner control interface through the use of Symetrix Zone Mix 760 audio DSP architecture and ARC-2 interactive wall panels, a package that offers sophisticated processing such as ducking and automatic gain control, along with bulletproof reliability that resists the ‘improvements’ of well-intentioned but under-qualified establishment employees. In contrast to an operation like STATS, which was conceived from the outset almost as a temple dedicated to the integration of multimedia, small-scale restaurants such as McGann’s do not always see the value of such enhancements and, as a consequence, can constitute a tougher sell. Cody is keen to make a distinction, however, between those restaurants that are driven by visual impact and those—usually upscale—dining places that require a subtler mood. Or, as she put it: “There’s a difference between a venue where AV is used to create the atmosphere, and one where it’s used to enhance it.” In the latter, you are as likely to be given the chance to watch the Falcons as you are to be served a quarter-pounder from a polystyrene box. “At high-end places, it’s all about the chef and the kitchen, and what they’re doing,” Cody pointed out, “and the operators don’t want their systems to detract from that. Their biggest consideration will likely be good sound quality, and a key issue there is sound masking. Some of these restaurants are right off the casino floor, and they don’t want the noise from the floor to be audible in the restaurant at all. Regardless of what the venue charges for its food or beverages, it seems that the march toward higher-quality audio and video is a relentless one that can only benefit contractors. Especially because restaurant customers of all shapes, sizes, and budgets are becoming accustomed to higher resolutions in other areas of their lives.